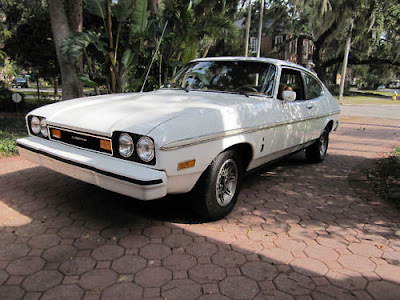 This 1976 Capri II has a claimed 25,000 miles on it. It has the preferred engine and transmission combination; the Cologne 2.8 liter V6 mated to a 4 speed manual. 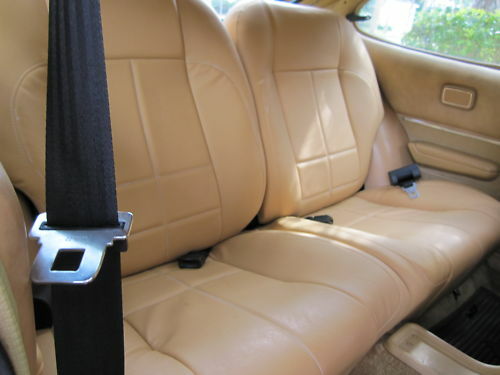 The paint is original, but the seats have been redone. The European built V6 Mercury Capris are really fun cars to drive. If this is everything the seller says it is, it's a very desirable car. Located in Tampa, FL, click here to see the eBay listing. Well, the seller earlier today did put up a link on the page (and it's automatically displayed on the page too) to a Photobucket account which has a slideshow of 23 pictures, and it's definitely more helpful in looking at the car... and the vehicle does look pretty sharp. I had one of those cars, a 1976 Mercury Capri II, made in Frankfurt West Germany....which I owned from 1980-1990. It had a 30,000 mile waterpump, which always failed at 30,000 miles. The brakes were terrible...squealed like crazy, and rotors warped after 10,000 miles. It also had terrible door locks and catches which froze at 32 degrees F. The rear door struts gave out and were almost impossible to replace. It did have great vinyl seats, the best I'd ever seen during that period, and a throaty gutsy 2.8 Liter engine with a killer 2nd gear you could race up to 60mph. All in all it was NOT a good car, but it was fun to drive, even with the lousy mechanical clutch cable it had, which failed at least 2x when I owned it. The throttle cable was also a nightmare, and was subject to kinking. All in all, the negatives far outweighed the positives, but as you can see it did leave some impressions on me, although most of them were not good.